The idea of an amulet, a charm, pendant, something we wear or keep with us for luck, to ward off “evil” spirits, to bring a bit of magic into our lives, or just to give ourselves a sense of wellbeing. Often amulets and talisman are very personal and may have a deep meaning to only the wearer. They could also be something that is generally considered a good luck charm, such as a horseshoe, lucky penny, rabbit’s foot, a four leaf clover or a simple cross pendant on a delicate gold chain. 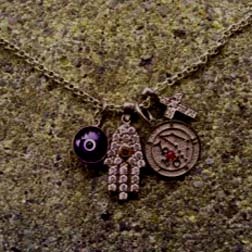 According to Wikipedia, “amulets and talismans are often considered interchangeable despite their differences. For example, the amulet is an object with natural magical properties, whereas a talisman must be charged with magical powers by a creator.” (1) Who knew this was so involved? So, I wonder what category my lucky horseshoe pendant I had as a kid fit into? Something tells me it wasn’t magical. Recently, I’ve been wearing a chain with four little “good luck” charms. An evil eye, that a really good friend brought back from Istanbul for me, a tiny diamond cross, a cubic zirconia Hamsa hand pendant, and a weird little Capricorn astrological pendant with my “lucky” numbers and a microscopic cabochon ruby. So, the question is this, does wearing a purported “good luck” charm actually bring any good energy your way, or does it have a great big cosmic placebo effect? And then the inverse is also true, just because something bad happens when you’re wearing your sparkly lucky charms, does that mean they’re bad luck and you should trade them in for something new? This where my weird superstitions come into play! So far there’s no evidence of any of it actually bringing me any good luck, but who knows what would happen if I stopped wearing it! At the very least, jewelry should make you feel good when you wear it So, I guess I’ll continue to wear mine and hope for the best! I hope everyone has a “lucky” day! And check me out at Eight of Swords (www.eightofswords.com) in Williamsburg, Brooklyn!!! Nice, everyone needs something & thanks for reading!